I am a big fan of having a homelab at home. It enables me to test software without the danger of destroying something in a production environment. And sometimes it is really interesting to break something just to see/test the effects. As budget is always a topic (hardware costs and power consumption) I decided to keep it small. I bought a refurbished DL360 Gen8 on Ebay for under 200 Euros. With the help of friends I was able to get retired hardware from companies (RAM, a second power supply and hard disks). Thanks to Alexa I can power on the DL360 also from remote. So I can turn it on/off whenever I need it and it is not necessary to keep it running all the time. All VMs are configured to start automatically in the correct order and I can connect to it from remote using Veeam Powered Network (VeeamPN). If you are interested in VeeamPN you can read more about it in my blog post “How to use VeeamPN to connect to your homelab when on the road“. To play around with VMware features I use nested ESX hosts to simulate cluster behaviour, eg. for failover tests, DRS settings, HA settings and so on. As of my current job role my main interest is running Veeam Software at the moment. It enables me to showcase special configurations to my customers and/or to test the different solutions. 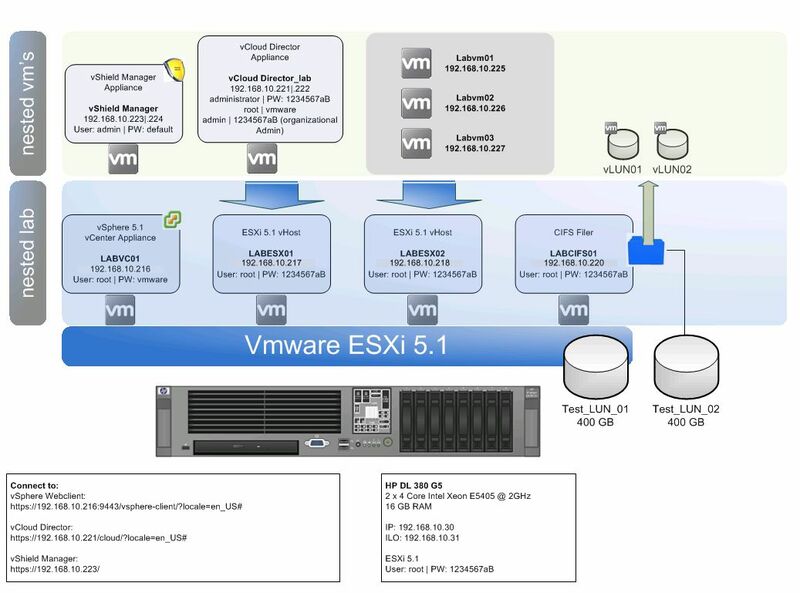 This collection of How-to’s will help you to build your own (nested) Home LAB using VMware vSphere 5.1, vCloud Director and vCloud Networking and Security. All you need is some hardware (eg. an old HP DL380 G5) and some time to play around. It is no problem if you do not own a shared storage like a Synology, as we use an openfiler to provide an NFS share, using the local hard discs. But it would certainly be an advantage if you have some RAM in your server (minimum should be 16 GB RAM, but 32 GB would be great). This How-to’s will help you to understand the necessary steps to install the products mentioned above in your homelab. But it is definately not a setup/design for a production environment, and Best Practices were not taken into consideration! I am trying to build my lab for vsphere 5.1. I found this server, please let me know will this be ok to do lab before exam. what software did you use to build your vSphere design?